Say Goodbye To Your Website Feedback Tool. Here's A Better Way. Drop your existing feedback tool. Here’s why. Yes. I recommend dropping your existing feedback tool. Because chances are little that it will fit into the workflow of your designers, developers, and customers. Collecting feedback is easy. Managing feedback isn’t. Basically, collecting feedback from colleagues or customers on new design drafts or website prototypes is easy. At least it looks like an easy workflow. After designing your first draft or developing the first prototype, you start gathering feedback. With the feedback you’ve collected from colleagues and customers, you begin re-working your prototype until everybody’s happy. Most people begin to struggle when the collaboration part takes place. Especially when more than two people are involved in the design feedback workflow, managing the feedback is a must-have. Otherwise, your colleagues and clients will report feedback the way they feel most comfortable. And then you’ll end up with a situation like this one. How to set up your feedback workflow. 8 Tips on managing feedback. To avoid unstructured feedback, but keep your workflow as simple as possible, I’d like to show you get more out of your feedback workflow when asking colleagues and clients for feedback. 1. 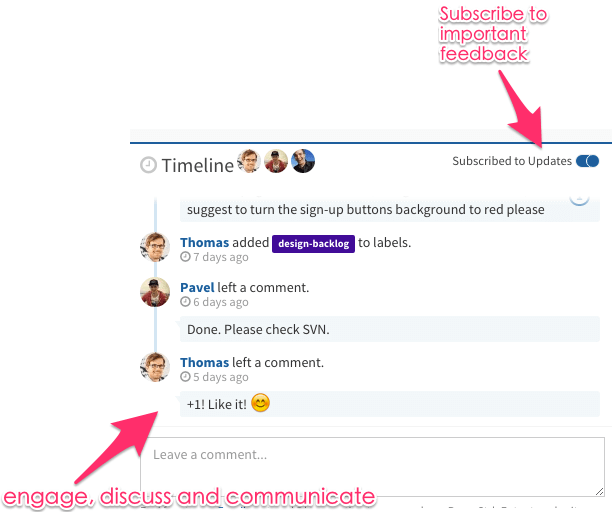 The basics: Keep your feedback workflow transparent. Whether you’re a one-man web design show or a global digital agency, keeping your tasks transparent is a clear win. Not keeping your colleagues and clients in the loop about ongoing tasks can end up in a lot of misunderstandings and troubles. Try to keep every project member involved. 2. Set up a browser-based User feedback tool. With Usersnap you get a tool in your hand which makes managing user feedback on design drafts and prototypes super easy. 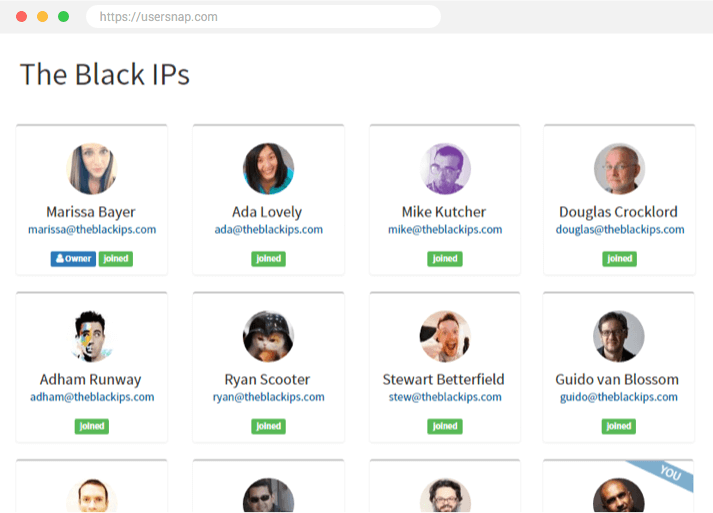 An awesome feedback tool – like Usersnap – helps you to manage feedback more efficiently. Therefore, Usersnap offers a great variety of easy-to-use tools for providing feedback. With annotations and drawings, people can leave feedback where they are. In their browsers. By making use of a browser-based feedback tool, installation and setup costs can be reduced to a minimum. No installation is needed on any device which makes it super easy for clients and colleagues to actually start giving feedback. The customer feedback solution from Usersnap offers you a great way to collect user feedback. Sign up now and start with your feedback efforts. 3. Embed a feedback widget on your website. Avoid installation for clients & colleagues. If your developers are already working on a web app prototype or website, I’d definitely recommend making use of the feedback widget which is part of the Usersnap feedback tool. 4. Keep everybody in the loop and invite clients to your feedback tool. When working on a web project, chances are high that you already have a project management tool set up for managing project tasks and deliverables. In most cases, you’re probably using this project management tool internally. When managing & collecting feedback, I’d recommend not only using it internally (to share feedback between designers, developers and project managers) but also with your external clients and website users. Everybody involved in providing and managing feedback should be invited to work inside your feedback tool. 5. Make your feedback tool the home of your project team. Having a feedback tool in place is just half the win. Creating a vivid place where designers, developers, and clients discuss and collaborate on feedback is definitely the big win here. No matter if you’re the one reporting a new idea, change request or simply leaving a feedback on your website, or if you’re the one responsible for fixing that problem. You’re automatically subscribed to new feedback updates for your relevant tasks. Besides that, you can subscribe to any other feedback created in your project dashboard. By making use of this subscription features, you’ll get notified of new comments, changes or statuses via email and browser notifications. 6. Pro tip: Limit access for team members. 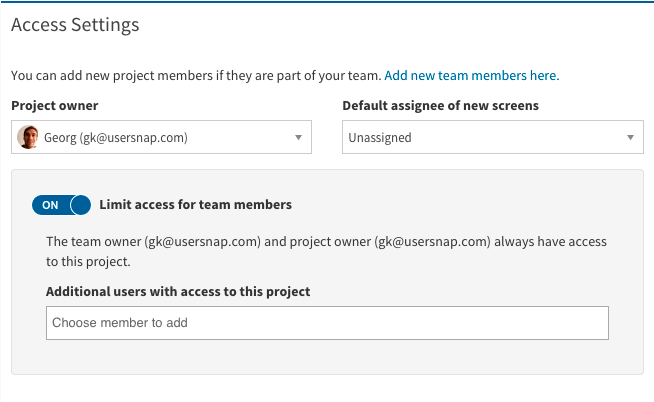 If you have various projects set up within Usersnap, you might want to limit access for various projects. For example, if you’re inviting external clients to your Usersnap feedback tool, you can limit their access to certain projects. 7. Pro tip: enable customer care features for external beta tests. Besides feedback from colleagues and clients, you might want to start doing external beta tests for your new web app or website. By activating the customer care feature inside Usersnap, there’s no necessity to invite all beta testers to your feedback tool. Beta testers can simply leave feedback on your website or web app with the embedded feedback widget. All comments (left by your developers or project managers in charge) can now be sent to your beta testers inbox which makes communication between testers and internal teams super easy. Learn more how to set up Usersnap for beta testing and customer support. 8. Pro tip: send feedback to your project management tool. When integrating your feedback tools with other tools your team members are already using you can definitely boost productivity. Depending on your team size, you might want to send the created feedback automatically or manually to your project management tool. That was a lot. Do not over-engineer. Wow. This was quite a lot of information on how to set up your feedback workflow. There are a lot of things to bear in mind when managing feedback. And there’s one important lesson which you should not forget: You can set up a clear and easy to understand feedback workflow with a lean, browser-based feedback tool like Usersnap. But do not over-engineer. Never. Depending on your team size, do not micro-managing feedback and the way how to collect it. Though it’s important to have clear guidelines and workflows in place when collecting feedback from colleagues and clients.